This month I'm celebrating my blog's fifth anniversary with a selection of reviews and giveaways. I'm really excited to start things off with a very generous ottoman giveaway! 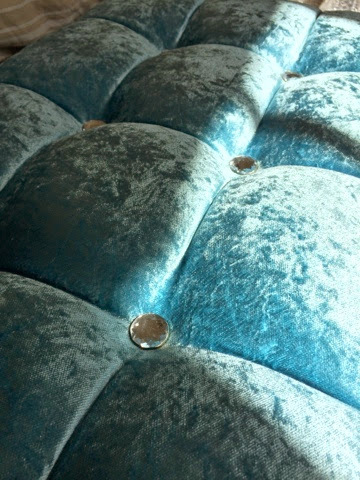 Bespoke hand upholstered in luxury soft velvet, and made completely in the UK factory, finished with brilliant del Monte crystals, this ottoman isn't just a statement - it's also a practical storage bench. It arrived with just a few finishing touches to do - the feet were really simple to pop on - they literally just pushed in! The lid hinges needed to be screwed on which only took a few minutes and it was all good to go! 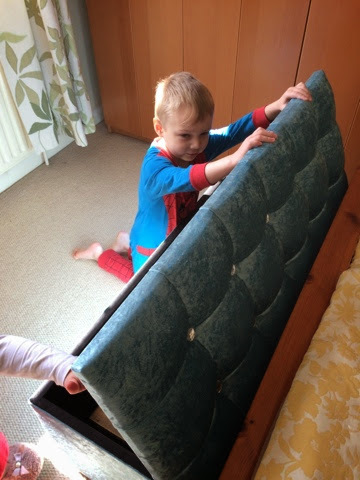 The ottoman is fully lined and the lid stays open when you are putting things in, which is really handy! The bench seat is generously padded and super comfy, while the storage area is big enough to hide all my spare bedding and blankets in. Our one is the small size which sits nicely at the foot of our double bed. 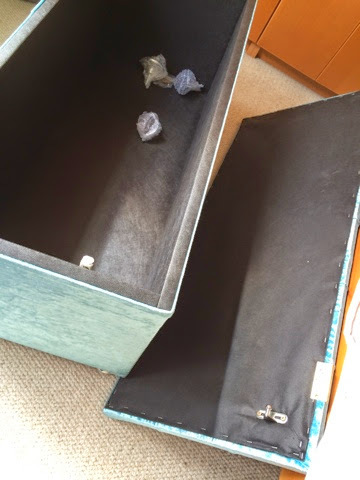 In Sky Blue Velvet, the Boutique Torino Ottoman is a lovely addition to our family home - it's a good size for storing things in (I'm using it for bedding and towels) this has quickly became something I use daily! Completley handmade in Great Britain upholstored in luxury velvet, this Ottoman storage bench costs £219. It's available in a plethora of fabrics and sizes. 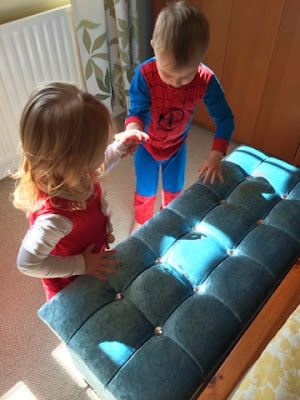 I'm very excited to tell you that Portabello Interiors have a Sky Blue Velvet Small Boutique Torino Ottoman to giveaway to my lovely readers as part of my fifth blog birthday celebrations! Thank You to Everyone who entered, this competition has now closed - entries made after closing have not been counted. 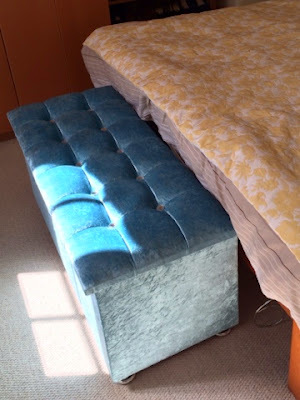 One winner will be selected using random.org to win a Sky Blue Velvet Small Boutique Torino Ottoman please reply with your details with 7days of winning or another winner will be selected. Competition closes 31st May 2014 at 12noon. UK (excluding Northern Ireland) entries only please. Prize sent out directly from the prize provider - Portabello Interiors. Portabello Interiors are responsible for providing the prize and will send the prize to the winner directly. http://portabellointeriors.com/product/antique-leather-chesterfield-footstool/ to put my feet up - wishful thinking! 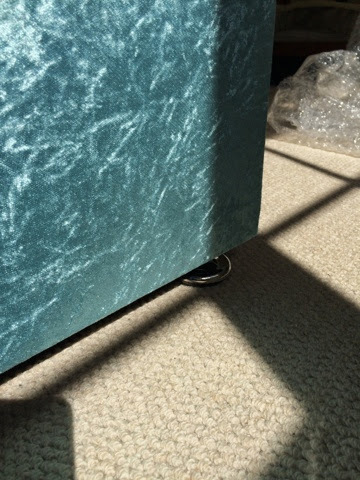 http://portabellointeriors.com/product/duck-linen-torino-ottoman/ - Lovely in linen! Great giveway thank you! I love their Purple Velvet Chesterfield Armchair! I have commented on Happy Star Wars day! Tweeted your fab comp as @Carriecakes80! Liked and Shared via Facebook. This looks like quite the stand-out piece! http://portabellointeriors.com/product/purple-boutique-chesterfield-armchair/ Caught mt eye, lovely colour. I love the King size purple Grande bed.I am following Portabello Interiors on facebook. Also - I have followed your on twitter, etc! My twitter is @vbmerry, and my email is pinkandsapphire@gmail.com. The Ruby Old English Leather Milano Tablestool caught my eye. The Boutique Wine Superking Grande Bed. Luxurious!